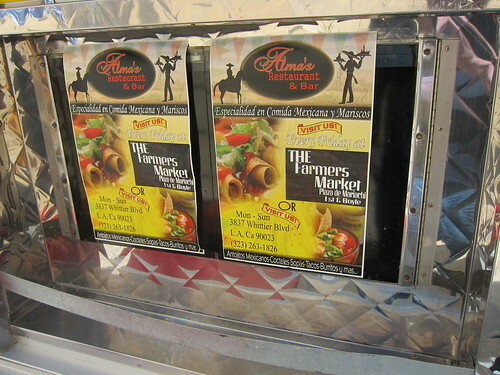 It’s not that easy to find taco trucks during the daytime on a weekday, even in East LA. 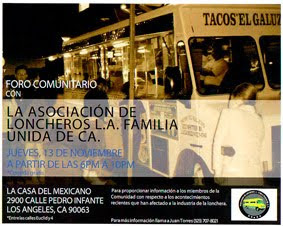 Most of your taco trucks in LA operate at night. There’s more people out at night for one but another reason is the truck operators are less likely to be harassed by city parking enforcement (or the city in general). Almost all the taco trucks I eat from are licensed but those licenses don’t always stop the city from arbitrarily enforcing vague ordinances or parking restrictions. After 6pm both the licensed and unlicensed taco trucks for the most part are left to operate more freely without worrying about the city. 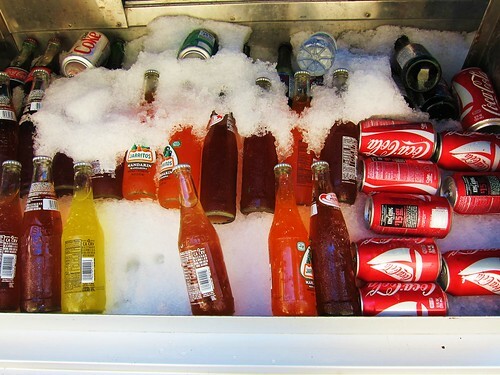 It is a shame because of the taco truck’s cultural importance in LA. The taco truck is the soul of the city. 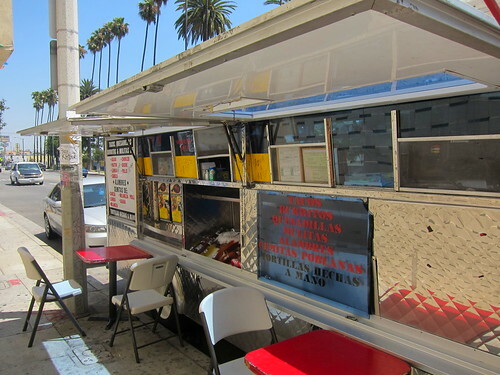 From Venice Beach to the San Fernando Valley to the barrios of East LA the taco truck is a vein that pumps the heart of the metropolis. Yet the city is in constant conflict with this culture and by extension with itself. I was lucky to find a taco truck this afternoon on Whittier Blvd in East LA. I was ready to give up and head North but decided I’d head a little further east. The decision paid off when a taco truck came into view. Alma’s parks right outside of a restaurant called Alma’s. I actually couldn’t find a name of the taco truck so I’ve just given it the name of the restaurant. I ordered carne asada and al pastor. The tacos came on top of homemade yellow corn tortillas. The carne asada was nice and tender and had a nice citrus flavor. The al pastor pungently spiced and full flavored with a little sweetness and peppery kick to it. The salsa was mild with a little sweetness to it, likely a blend of tomatillo, tomato , onion and jalapeno. The tacos came topped with a lot of cilantro. I love cilantro but there was a little too much. The problem here was that the taquero had separate containers of onions and cilantro to garnish the tacos with. Just from my experience of preparing my own tacos at home you want one container with the right amount of onions and cilantro with a little salt to break down strong flavor of the onion. Try grabbing just a little bit of cilantro. It’s not easy. Then try it after you’ve just pinched some diced onion from another container. It’s impossible. From Alma’s I drove East, then North, then I was back on Olympic and heading West. I came to Soto St and I really didn’t have much of a plan. It was one of those days where I just got in my vehicle and drove. I turned right on Soto then turned on 1st street heading West when I got a text from a friend asking if I wanted to grab a bite to eat. 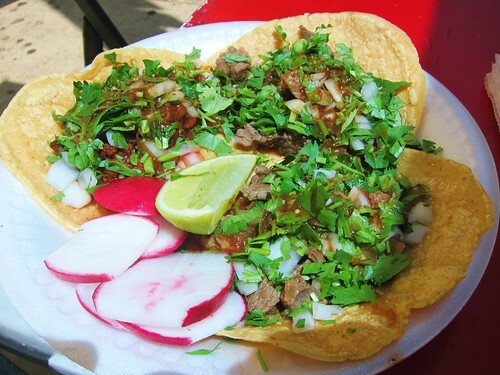 I’m East LA I replied, eating tacos.He replied back asking If I wanted to meet up. I would, I said, but I had to make a stop first. It just so happens when I pulled over to answer the text I was in front of Al and Bea's. You have given me a dinner idea. We don't have taco trucks anywhere near where I live but I sure can make some up. Thanks. Yum!Your posts have left me with a huge craving for Taco.I saw your blog from the foodie blog roll and I like what you have here.if you won't mind I'd love to guide Foodista readers to this post.Just add the foodista widget to the end of this post and it's all set, Thanks!